On those rare evenings I cook only for myself, I often prefer something simple and fast. 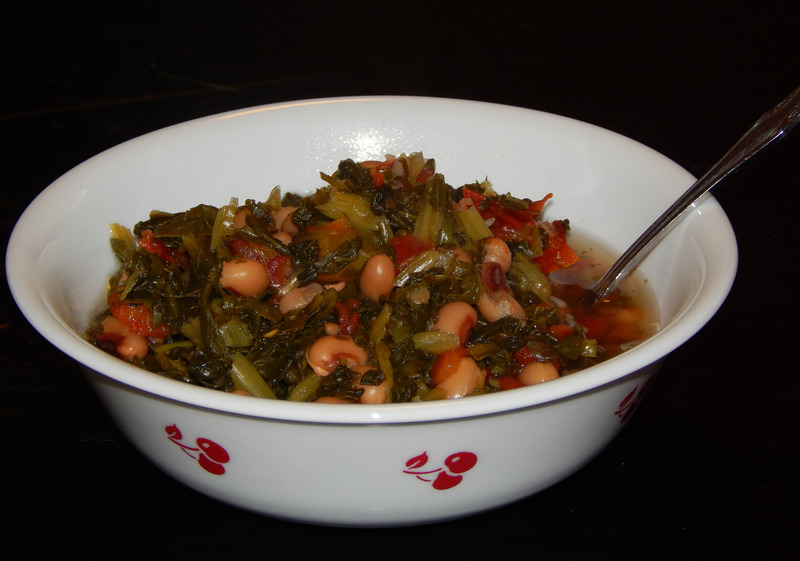 The last such evening, I came up with this black eyed pea and collard green stew. It’s simple – no chopping, no dicing, no sauteing or frying. If you can pitch things into a pot, you can make this. It’s fast – only about 20 minutes of hands-off cooking. It’s low-fat and nutritious – full of protein, fiber, iron, potassium, magnesium, Vitamin A, Vitamin C, and B vitamins. 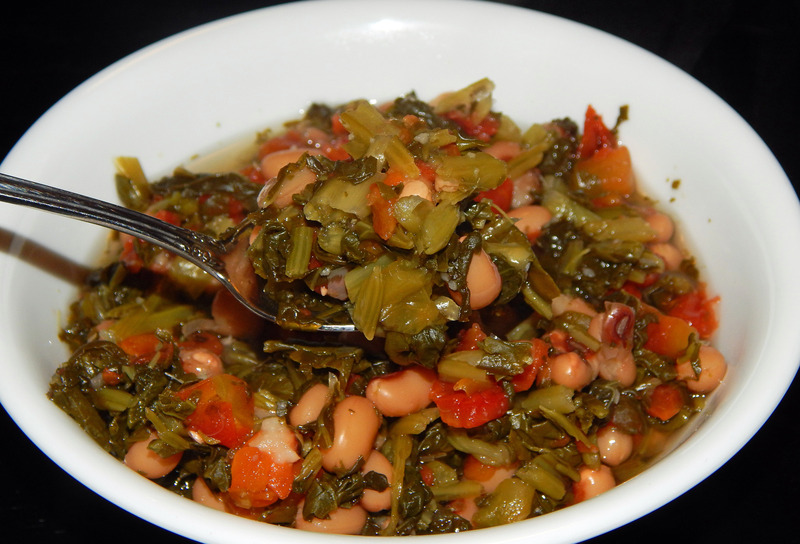 Dump the greens, black eyed peas, and tomatoes into a large pot. Add just enough water to the pot to cover the greens by about an inch. Bring to a boil over high heat, then reduce heat and bring to a simmer. Add liquid smoke, oregano, and salt. Stir to mix. Cover pot and let simmer, 20 minutes, stirring occasionally. 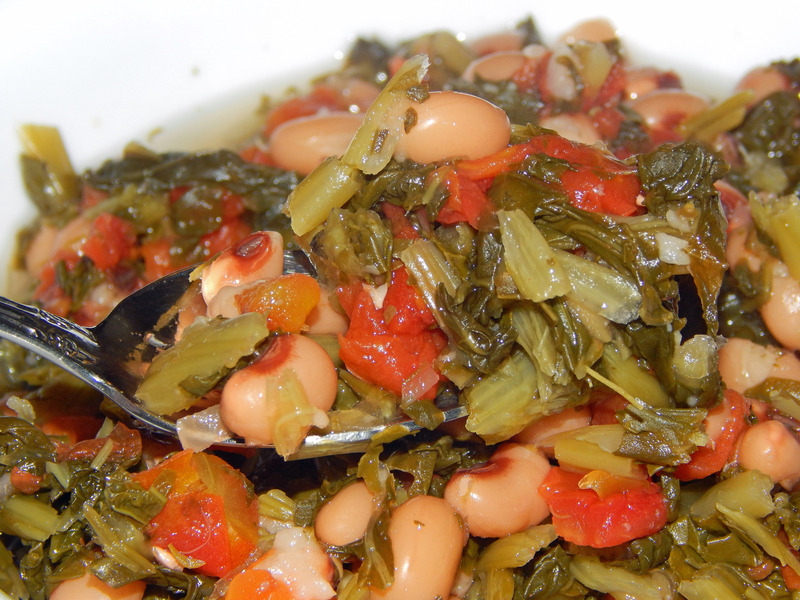 The beans should be soft and the greens tender. Taste, add more salt if needed and a good grind of black pepper. Top with chopped vidalia onion, if desired. And for a real Southern experience, a shake or two of tobasco! Although I love hoppin’ john (and skippin’ jenny), I tried eating leftovers served over rice and did not care for it that way. This stew is best served on its own. 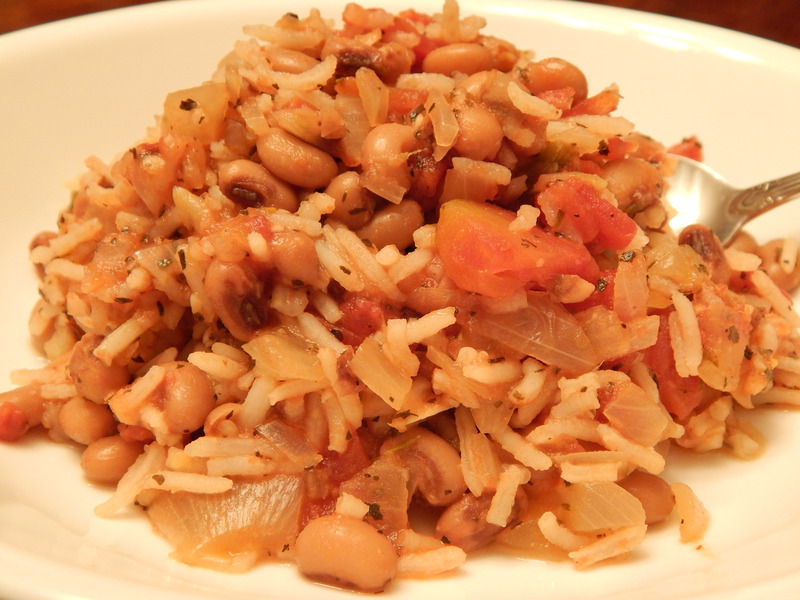 Hoppin’ John … another great black eyed pea dish! If you can’t find Ro*Tel tomatoes, or another brand of tomatoes with green chilis, substitute a can of petite diced tomatoes and a teaspoon of crushed red pepper flakes. Frugal Vegan Tip #1: Stock up on canned beans when they go on sale. Yes, dried beans are cheaper, but on those busy nights when you haven’t soaked your beans and don’t have much time to cook, canned beans can be a real money saver. Once you know a few quick things to do with canned beans (which I’ll go over in some upcoming Frugal Friday posts), you’ll stop reaching so often for those expensive veggie burgers, faux deli slices, and frozen vegan pizzas. Frugal Vegan Tip #2: If you like greens, keep your freezer stocked with frozen collards, mustard greens, turnip greens, and spinach. Not only are they often much cheaper than the fresh variety (I’m finding frozen organic spinach to be much less expensive than organic fresh), but they’re quicker and easier to prepare – which means, you may be more likely to eat them! Anytime you can pair a bean and a green, you’ve got yourself a meal.